Welcome! The Natural Systems Agriculture website is produced by a team of researchers and students in the Plant Science Department at the University of Manitoba. This team includes professors, graduate students, undergraduate students, technicians, research associates and a very helpful group of collaborating farmers. The research work conducted by our team includes both long-term and short-term studies. 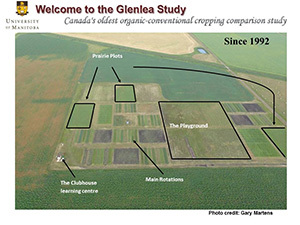 Our field studies include the Glenlea crop rotation study, Canada's oldest organic vs conventional study and the Organic Crops Field Laboratory at Carman, Manitoba. new generation no-till systems that include intense grain intercropping and cover crops. 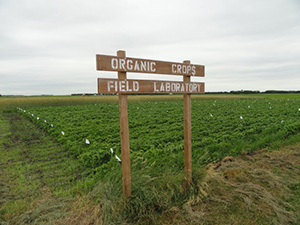 Our undergraduate students get to participate in this work plus studies on alternative nutrient sources for organic production; organic oat breeding; and on-farm crop management. We also involve students from our faculty's Diploma agriculture program. Our students and staff are involved in outreach through field days, webinars, winter meetings and seminars. This provides us the opportunity to share our findings with farmers, agronomists and others, and to receive valuable feedback. Farmers also work as research partners on several of our projects, and contribute critical input into the knowledge generation process. Our work is sponsored by farm organizations, government, industry, several non-government organizations and private donors. We gratefully acknowledge this financial support. Within each of the following topics, you will find articles based on research carried out by the University of Manitoba and our collaborators. For a complete alphabetical list of all articles, please see the Site Map.